Del-Tron's linear air actuators (also referred to as linear actuators) are pneumatically actuated crossed roller slide assemblies controlled by a pair of Airpot air cylinders which provide extremely low friction and stiction characteristics. A light touch or physical obstruction will stop the unit’s movement to prevent damage to delicate and expensive equipment and parts. Low pressure operation is possible. The PNRE series requires less than 10 psi to operate. Each slide is comprised of an aluminum carriage straddling an aluminum base. Using a bearing system containing cylindrical steel rollers, the carriage glides almost friction-free over the base. 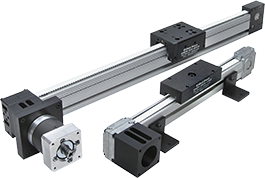 Other industry terms include linear actuators, linear motion slides, and more simply, motion slides.